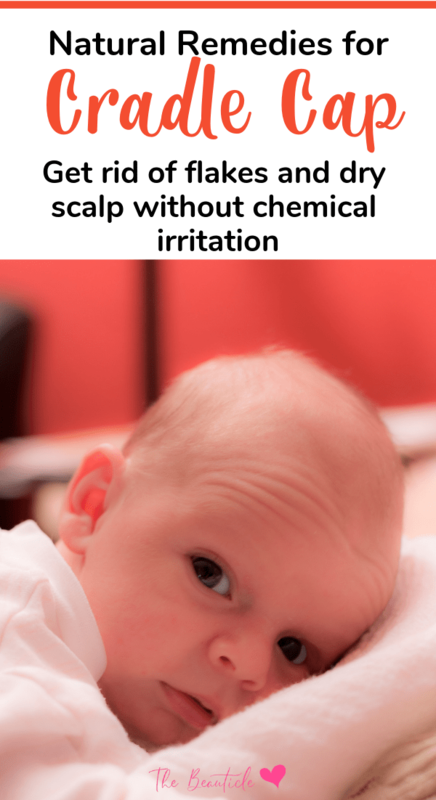 If your newborn has baby dry scalp and you’re looking for natural remedies for cradle cap, I’ve got a few of my favorite tested solutions for you to try. It’s perfectly normal for newborns to have flaky dry patches on their scalp, face and other parts of their bodies. Severe conditions of baby dry scalp is known as cradle cap. Dry scalp on babies looks like white dandruff-like flakes that are really just their old skin shedding. If your little one is suffering from dry skin, it could be because of a number of things like the baby shampoo you use, baby oil, the weather, another skin condition and more. This article isn’t meant to give any type of medical advice. You should certainly seek your doctor’s opinion on anything concerning you about your baby. What I will share are a few ways that I have eased my little one’s severe case of baby dandruff and cradle cap. What causes cradle cap in babies? Yellow, thick scales on your baby’s scalp and face is known as cradle cap and is old skin shedding. The proper term for cradle cap is infantile seborrheic dermatitis. It is often confused with eczema but it does not cause itching and is not contagious. This flaky skin condition isn’t a reflection of poor health. It’s just a natural part of newborn life. It usually occurs in the first week weeks of baby’s life and clears up on its own before the baby turns one year old. It can also appear on other parts of the body such as the eyeborws and ears. It does not cause the baby any harm and doesn’t itch but can be unsightly for mom. An answer to this question is hard to come by. Some say cradle cap is caused by hormones passed from baby to mom while others say it is caused by the same yeast that causes dandruff in adults. For a few babies, cradle cap can be caused by antibiotics either given to mom before birth or to baby while in hospital. Even more theories suggest that cradle cap can be caused by harsh shampoos or baby formula. What’s certain is that a baby with dry scalp is nothing to worry about. Using a shampoo developed specifically for newborn dry scalp and cradle cap (like this one pictured below) and a soft bristled baby brush to massage away the flakes works well. My poor baby looked like a lizard from his forehead up. I’m talking about scales! We tried everything that we were told to do, we brushed every day (which just resulted in flakey scales), the ointment we were told to use just made the scales thicker and yellow. So I bought this hoping ir would do SOMETHING and oh my god did it. I gave him a bath like usual and once his hair was wet I combed it back. Then, I put this on a soft bristled brush and washed his hair in tiny circular motions with the brush. Since he had so many scales I had to rinse almost immediately then I repeated the process, rinse hair, comb back, brush with shampoo. All the scales on the back of his head and side are completely gone. The only spot with anything left is the crown of his head where the flakes were the worst. I’m sure after a couple more shampoos that will clear up to. If I could give this 10 stars I would. And it smells FANTASTIC like the other reviews say! Try this shampoo for babies with dry scalp with this brush specifically designed to gently lift flakes from your baby’s scalp and skin. Here are some cradle cap home remedies if you’re looking for more natural remedies for dry scalp on babies. It’s no secret that coconut oil is a miracle oil that has a myriad of uses in the bedroom, bathroom and even for baby, from bump and beyond. Coconut oil is also great for baby dry scalp treatment as well as olive oil or jojoba oil if you prefer. You may even add in a drop or two of lavender essential oil to help loosen the flakes of cradle cap. Massage in this oil on affected areas and allow to penetrate for 10-15 minutes. Use a soft brush to lift away flakes and be sure to rinse well as oil left behind may clog baby’s pores and worsen the problem. One of the best home remedies for cradle cap is using baking soda. Create a paste with baking soda and water and rub onto the infant dry scalp affected areas and allow to sit for only a minute or two then rinse off in baby’s bath. There’s no need to follow up with any kind of soap or shampoo for baby dry scalp as the baking soda is effective at cleaning the baby’s skin and scalp. Following up with soap of any kind may cause over-drying, leading to even more of an issue. One of the causes of cradle cap can be the dryness in the air in your home. If you feel this is a reason that may be affecting your baby, try using a humidifier in the baby’s room. Add a few drops of mint essential oil to help purify, energize and refresh the air. 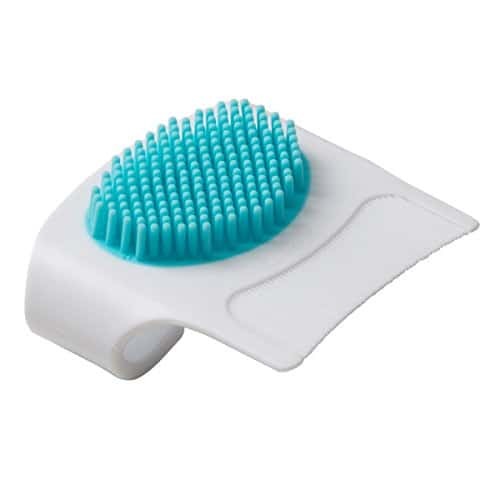 A cradle cap brush such as this one is specifically designed to gently lift flakes away from affected areas. It is gentle enough to use as often as needed. Using it in conjunction with your baby dry scalp shampoo will help to lift the flakes quicker. Be careful not to further inflame the area with over-brushing. Watch for redness.